Today I bring you a card made with a fun technique that can be used in a multitude of ways. Try it out and have fun! I started by spraying the white cardstock with the Picked Raspberry re-inker, that I mixed with alcohol in the Stampin’ Spritzer Bottle. Then I punched out a couple of butterflies and flowers, displayed them on my ‘white’ cardstock, that at this point was more pink, and mixed the Seedless Preserves re-inker with the alcohol, and sprayed it on top of the cardstock. Once done, I removed the butterflies and the flowers. 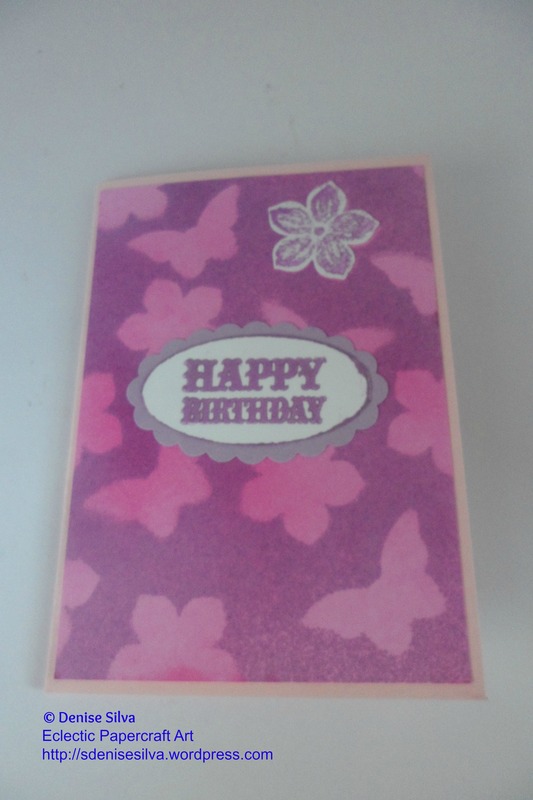 It was time now to stamp the word ‘Happy Birthday’ on a piece of white scrap paper, inked the edges with the same ink, Pearlescent Purple. I had a piece of scrap of the Wisteria Wonder cardstock from the Subtles collection, so I punched it out with the Oval Scallop punch. I had some flowers left over, that I had stamped and punched out, from another card. So, I added one that was stamped with the Pearlescent Purple ink. To finish I assembled everything with liquid glue. 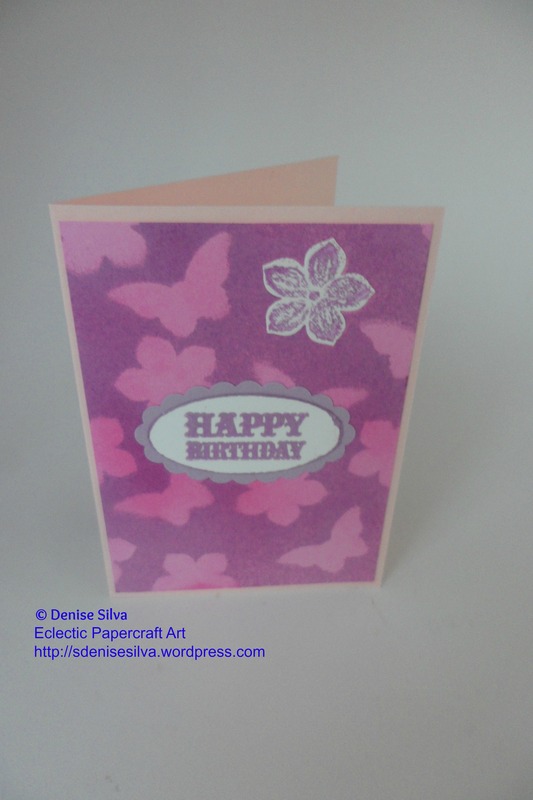 This entry was posted in Cards and tagged Handmade card, Handmade Happy Birthday Card, handmade presents and gifts, Inking, paper art, papercraft, Stampin' Up!, Stamping. Bookmark the permalink.